According to UNICEF India data 2017, child marriage rate by 15 years is 18% and by 18 years is 47%. 27% of girls in India are married before their 18th birthday and 7% are married before the age of 15. India has the highest absolute number of child brides in the world – 15,509,000. Siddhi, a 17 year old from Parkandi village, Satara belongs to a family of six; mother - who is a homemaker, father – who works as a driver in Mumbai and three siblings – two sisters and a brother. Everyday she travels 4-5 kms away for school. 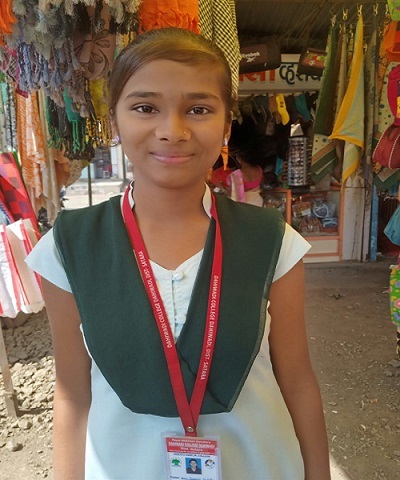 Due to financial constraints, her parents could only afford to enroll her younger brother to a private English medium school, while Siddhi and her sisters go to Government Marathi medium school. But Siddhi wished for something else. Miffed with her mother’s wish, Siddhi stopped talking at home. Her mother tried very hard to convince Siddhi but she was adamant. Two days later, she started a dialogue with her mother and explained why she wasn’t ready to marry yet. As a part of Gender Sensitization/ Child Right and Protection Program, CORO has formed children’s’ and young girls group in schools and villages/ communities. Our social animators hold interactive sessions with these groups regularly. During one such session, when Karishma and Nitin (CORO members) visited Siddhi’s house, she mentioned to them about this marriage proposal and that she was absolutely against it since it also involves violation of child marriage law, which she got to know from CORO’s program. She was sure that no matter what the boy’s family says, after marriage, she will have no personal space and freedom to express. Siddhi pleaded Karishma and Ntitin to convince her mother, reject this proposal and let her focus on career prospects. Karishma narrated her own story and shared the consequences of early marriage, which she had experienced herself. After hearing Karishma’s heartfelt life journey. Siddhi’s mother decided to not compromise her daughter’s future and rather help in achieving her goals. At present, this teenager studying in FYJC (First Year Junior College) is enjoying her regular life, concentrating majorly on studies and putting enormous efforts in spreading awareness about child rights, in her village. Child marriage is a violation of child rights, and has a negative impact on physical growth, health, mental and emotional development, and education opportunities. While regional disparities exist, child marriage has significantly decreased from 47 per cent (2006) to 27 per cent (2016), as per UNICEF.